Even though I'm not as big a fan of professional football as I am of college football, I'm excited about watching the Super Bowl today. A large reason for that is because of the commercials. Given my advertising background, I still love to watch and critique commercials. Hopefully the ads this year won't disappoint. Another reason I'm excited about the Super Bowl is because it's being held in my old home, Texas! And apparently I'm not the only one excited about the location. 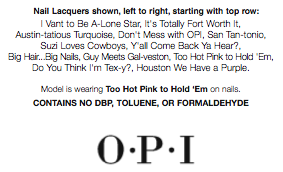 OPI nail polish has come out with an exclusive Texas Collection that has perfect color names to commemorate the great state of Texas! Houston, We Have a Purple. 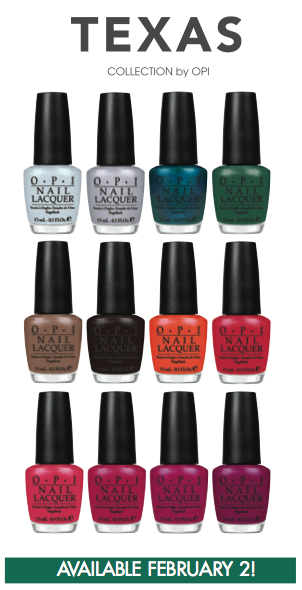 Austin-tatious Turquoise. I love it! I definitely think I need some of these.